A quality stroller is one of the more important baby essentials for parents on the go with babies and small children. While wearable baby carriers offer closeness and hands-free mobility, a stroller is sometimes a more comfortable and economical choice for certain trips and activities. When selecting a stroller, parents will need to consider their budget and the age(s) and weight(s) of their child(ren). These factors will play a critical role in determining which type of stroller is most appropriate. Additionally, lifestyle features should be evaluated as different strollers offer varying benefits to casual vs. on-the-go families. Pros: The best umbrella strollers are lightweight, often weighing less than fifteen pounds, some even weighing less than ten pounds! Lightweight strollers often open and close easily, and they take up very little space with their sleek frames. Cons: In their effort to save on space, few umbrella strollers are able to safely accommodate infant seat attachments, and many available options lack substantial (if any) storage space. The typical umbrella stroller is best used for supported sitters to small children from about six months to 45-50 pounds (depending on stroller specifications). Additionally, many lightweight strollers have smaller, less efficient wheels, which can result in maneuverability challenges on different terrain. What to look for: While compactness is the hallmark of lightweight strollers, parents should ensure the frames are sturdy and fabric seats are strong and well attached. The safest umbrella strollers have a five-point harness and securely-locking brakes. Any storage space should be well-placed to ensure stroller stability, and parents should carefully read storage limitations to avoid tipping. Pros: The best travel systems include an infant car seat and a specifically matched stroller to ensure safe and secure compatibility, though there are other manufacturer-approved add-on options for regular (non-system) strollers. Travel systems can be an economical purchase for new parents as there are often bundle price options. Travel systems can include regular, jogging, and double strollers; so many options are available to fit family lifestyle and growth. Cons: Travel system compatible strollers are bulkier than lightweight, umbrella stroller models. They fold easily, but they are not as compact and may not fit in the trunks of some smaller vehicles. Parents will eventually need to make another purchase once the child outgrows the infant car seat. What to look for: All elements in a baby travel systems should be designed/ manufacturer approved for configured use. In the case of baby travel systems, parents will want to research safety features and reviews for both the car seat and stroller included. Ideally, both the car seat and stroller will meet safety and quality standards and have high market reviews. Pros: Three-wheeled jogging strollers are set apart from regular strollers due to a number of features including three large wheels, ergonomic handle bars, and hand brakes. 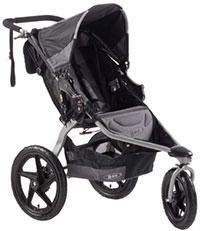 The best jogging strollers are designed with active parents and child-safety in mind. The front wheel on a jogging stroller can swivel to enhance maneuverability or lock to increase stability for high-speed running. These strollers include comfortable, reinforced seats for babies, large canopies (often with SPF protection), and a smooth ride for all-terrain mobility. 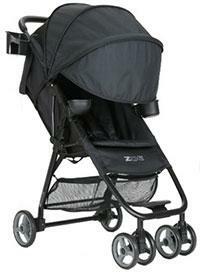 Some jogging strollers are car seat compatible or recline enough to support infants. Cons: According to the American Academy of Pediatrics, “Most jogging strollers, on the other hand, aren’t recommended for use during the first 5 or 6 months because they aren’t designed to recline (although some have secure enough harnesses and positioning for younger babies).”Jogging strollers are often bulkier, even when folded, and the tires can take up a lot of space. While the sturdy frame is intended for child safety, this can make the stroller difficult and/ or awkward to fit into smaller vehicles. Parents who are serious runners will also want to ensure their stroller is actually an optimized jogger. Most three-wheeled strollers are labeled as “joggers;” however, there are many that are far less optimized than others and lack safety features like hand breaks, ergonomical handle bars, and suspension systems. What to look for: A five-point harness is an absolute must for optimal jogging stroller safety. Ergonomical handles should be tested for comfort, and parents may want to explore stroller models with adjustable handle bars (some models include 9-levels of handle bar adjustments for optimal comfort). Joggers with larger wheels (at least 12” in diameter but even upwards of 15-18”) are more agile and handle more smoothly through rough and rocky terrain. Many jogger models include larger wheels in the back with a slightly smaller wheel in the front. Highly optimized joggers will incorporate large-diameters for all three wheels. Higher-end (and more expensive) models will include wheel suspension to absorb shock and provide a smoother ride for baby. Taller parents will want to explore jogger models without a rear axle to provide space for a longer running stride without kicking the back of the stroller. Pros: The best double stroller models are versatile and support families with children of varying ages from birth to 40 pounds or more (depending on model specifications). For parents with more than one child, the double stroller allows a single unit for transportation. Double strollers are available in side by side or tandem (front and back) models, each with their own advantages and disadvantages. Side by side double stroller pros: Side by side models have leg room to spare! Neither child is stuck, scrunched in the back. These strollers have more jogging-style features and handle better on various terrains, and side-by-side models often have much simpler folding methods than tandem strollers. Tandem double stroller pros: Tandem double strollers offer roughly the same width of a single stroller. This means doorways are not going to be a problem. Configurations on a tandem stroller can be more dynamic than side by side models, including various reclining options, a bench for older children (as in some sit and stand models), or a simple single stroller for those models with completely removable seats. While tandem strollers often have a more complicated folding method than side by side models, the folded footprint is often narrower. Cons: The disadvantages of double strollers typically stem from size and weight—especially when infant car seats are attached. A double stroller toting two infant car seats can weigh over 50 pounds, which might present challenges in maneuverability (especially on stairs) and lifting in and out of the car. 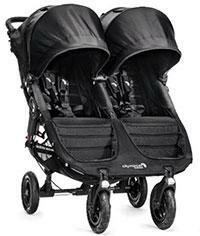 Side by side double stroller cons: Side by side strollers present major challenges with regards to doorway width. Due to the double-wide size, some side by side models simply do not fit through narrow spaces. Safety and balance can also be a concern for side by side models when using one infant seat—if the stroller is substantially heavier on one side, this could pose a tipping risk. 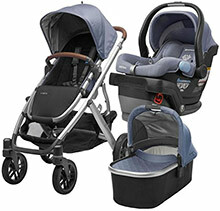 Tandem double stroller cons: Some tandem strollers/ configurations have limitations on seat weight and reclining. Tandem stroller length and front-end weight can make maneuverability a struggle, especially when turning. What to look for: Double strollers are more complicated systems than their single-passenger counterparts, this means there are many more angles—potential pinching hazards—for little hands and feet. Look for small spaces within arm reach and near foot rests. In addition to safety concerns, parents should examine the seat structure for comfort as many models will compromise this feature to limit size and weight. The unit’s folded size will determine suitability for fitting in the family vehicle. Pros: Without question, the best luxury strollers offer a stylish affect that can boost a parent’s mood and gait during a relaxing walk with baby. These high-end baby buggies are an undeniable status symbol, appearing in celebrity photos and popular television shows. The best luxury strollers make a personality statement with numerous designs and fabric options. Additionally, the materials used, including: framing, fabric, and even the wheel rubber are higher quality and can expand durability and longevity. 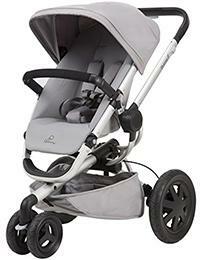 Luxury strollers are available in numerous model types from pram and bassinette styles to travel systems and joggers. Cons: Of course, the price tag is a tick in the drawbacks to a luxury stroller purchase. Further, some luxury models are angled more toward urban strolling in stores or on small pavement with smaller wheels. Due to their stylish frames, luxury strollers often forgo features such as cup holders for both parents and children. What to look for: For parents ready and willing to ignore sticker shock and pay top dollar for a luxury stroller model, the features to look for include form as well as function. Luxury models should handle as well (or better) as their lower-priced counterparts while also offering trendy, fashionable style and materials for the price. Stroller costs can range from $20 to well over $1,000. The popular UppaBaby Vista and Mesa Travel System, for example, is usually about $1300! This opens a substantial window to scrutinize different brands and models as well as family mobility needs. Among other factors, materials including plastics and fabrics, as well as structure and safety features play into stroller cost. So, while the lower price point may seem enticing, the value may come from reliability and longevity. Due to newborn physical limitations, parents should ensure strollers are appropriate for infants who are not yet able to control neck muscles. Strollers intended for infant use should be able to recline or be used safely in conjunction with a carrier. Strollers also have weight and height limitations to ensure safe use. When selecting a stroller, consider the child’s current height/ weight and how long the stroller will be needed. If the child is already close to the height or weight limits, the stroller may not get much use, and it may be worth the time and expense to find a sturdier stroller that could be used longer. There are also convertible strollers that allow an older child to sit or stand in the back. Parents should mindful of weight guidelines per seat for these strollers. Exceeding weight limits on these strollers (especially with active, older children) creates a tipping risk for the stroller. While shopping for a stroller, reading online descriptions and reviews is crucial to making informed decisions. Once parents have narrowed down a list of contenders, they should head over to a brick-and-mortar store (even if they plan to shop online) and test drive the stroller models. During this hands-on experience, parents will be able to full assess dimensions with respect to their height and needs while testing turn radius and maneuverability. Additionally, parents should consider open and close facility and the unit’s weight with regards to lifting and fitting into their vehicle. There are certain model/ type specific features that are important (like ergonomics on joggers), and there are also some features that all strollers should include to ensure optimal safety. Federal Certification: In accordance with guidelines set by United States Consumer Product Safety Commission, nearly all strollers sold in the United States must comply with the mandatory federal safety standards to receive certification. Certified stroller brands will adhere to these standards to minimize hazards in regards to hinges, faulty wheels that break and dethatch, failing parking brakes, restraint issues facilitating child manipulation of buckles and/ or straps, structural integrity, and over stability. Five point harness: The five point harness has become almost standard in most car seats and strollers. However, there are some models (especially the lower cost umbrella strollers) that may include only three points of security in their restraint systems. During test drives, examine the chest clip to ensure security and consider how easily a toddler could unbuckle. Wide base: Strollers should be designed with a wide to offer the most favorable stability. Top heavy strollers will not turn well and pose a tipping hazard. Brake security: While test driving stroller options, parents should test brake security. Brakes should click firmly in and out of place. A flimsy brake system will be accidentally tripped or released posing significant danger to the child. Hinges and Gaps: Due to collapsibility, every stroller model will include various hinges that could become pinching hazards for children. According to the US CPSC, “Hinge issues that have resulted in pinched, cut, or amputated fingers or arms. These issues have the highest injury rate of all hazards associated with strollers.” Parents should be acutely aware of all movable parts and their locking systems. Additionally, examine footrests to ensure there are no gaps on the sides. This is especially important when purchasing a side by side double stroller; for optimal safety in this case, the American Academy of Pediatrics recommends there should be a single footrest that extends all the way across the both sitting areas as a child’s foot can become trapped between separate footrests. Canopy: The stroller’s canopy protects the child from sun, wind, rain, and snow. A well-designed canopy will be adjustable and extend for wide coverage. Certain stroller models use fabrics with SPF protection. While stroller shopping, parents will notice an abundance of design features differing from one model to the next. Here are some additional features to consider when refining stroller choices. Stroller wheels: Wheel type can range from rubber-coated plastic to air filled, with variations in size and durability. Rubberized wheels are best for smoother surfaces, while air filled tires are more rugged and offer a smoother ride on different terrain. Stroller storage: Babies require numerous of supplies during travel. Between diapers, wipes, toys, and snacks, diaper bags are often stuffed full. However, the American Academy of Pediatrics warns, “Do not hang bags or other items from the handles of your stroller—they can make it tip backward. If the stroller has a basket for carrying things, be sure it is placed low and near the rear wheels.” Some stroller models do not include undercarriage storage. For parents who carry a lot of baby supplies, or for those with multiple children, ample stroller storage may be a valuable feature in stroller shopping. Speakers: Speakers may seem like a superfluous stroller option, but this feature comes in handy to play music during an afternoon stroll or when your toddler needs to hear his favorite song again!